Starting capacitor for starting heavy-starting electric motors, e.g. for floor sanders, compressors, mills. 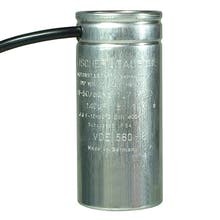 The capacitor may only be used for the start-up of motors. It must be switched off after the engine starts.